The 2019 Porsche Cayenne E-Hybrid rights a lot of wrongs by finally bringing 22-inch wheels and massaging seats to the Cayenne lineup—a nearly unforgivable oversight—and it’s also quicker and more powerful than the outgoing model. 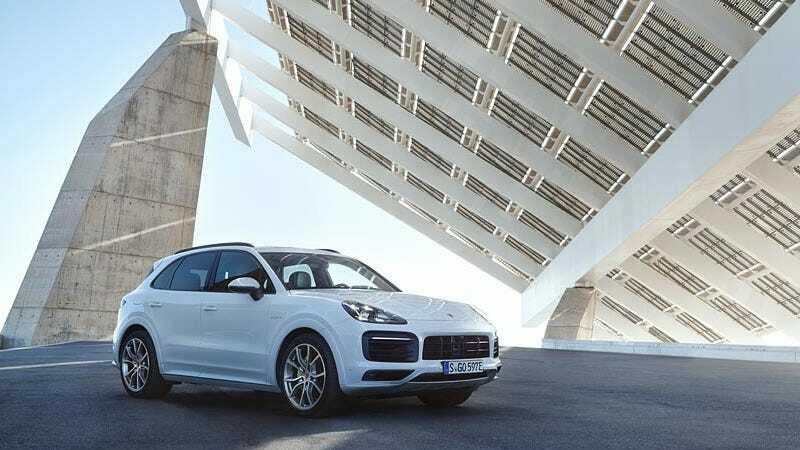 The updated Cayenne E-Hybrid smokes the outgoing model, jumping 40 horsepower to a combined 455 HP from the 3.0-liter turbo V6 paired with a 14.1 kWh battery and electric motor, with a combined 515 lb-ft of torque. It’s also 0.7 seconds quicker from zero-to-60 mph, now 4.7 seconds, and sets a new quarter-mile time of 13.3 seconds, almost a full second quicker than the old E-Hybrid. It can reach a top speed of 87 mph on battery power alone, with a full top speed of 157 mph. There’s new hybrid guts, including the eight-module, 13-cell 14.1 kWh lithium-ion battery and electric motor with a new electromechanical separating clutch, replacing the old electro-hydraulic system, which Porsche claims will translate into faster reaction times. Also new to the plug-in Cayenne is the Sport Chrono Package, Porsche’s Active Suspension Management system, a heated windshield, heads-up display and massaging seats. This is also the first Porsche with a 22-inch wheel option. It’s about time, I say. There are now six driving modes, four of which are hybrid exclusive, as part of the new Sport Chrono Package. Beyond the traditional Sport and Sport Plus modes, the E-Power mode is electric power only, capable of an EV range of 44 kilometers, or roughly 27 miles. Plugged-in with the standard 3.6 kW, 230-volt 10-amp charger, the battery can recharge in 7.8 hours, or 2.3 hours with the optional 7.2 kW 230-volt 32-amp charger. E-Hold mode conserves the electric energy to ensure a full EV range later, perhaps if it’s necessary for environmental zones, E-Charge mode boosts the power output of the engine to recharge the battery and Hybrid Auto mode let’s the Cayenne actively switch between various power configurations as it sees fit. The 2019 Porsche Cayenne E-Hybrid goes on sale in the U.S. early next year at $79,900 without options, or $80,050 without options if you include the $1,050 processing charge. If I was in the market for one of these, I would consider the hybrid almost just for the Acid Green flourishes on the brake calipers and tachometer needles. It’s basically a 918 Spyder.